Secretary of State Rex Tillerson and National Security Advisor H.R. McMaster, you will visit Ankara this weekend and next week to address what is now a crisis between the United States and Turkey. We are on a collision course over dramatically opposing goals. The United States is determined to eliminate ISIS as a threat in Syria and prevent its return. Turkey is determined to block any coalition of Kurdish forces from having a viable military presence on its borders. Over the past few years, each country has tried—and failed—to persuade the other to support its strategy. The United States now must both assert its position for a better future for Syria and work with Turkey. Without cooperation, the U.S. position will be weakened, risking an ISIS resurgence despite our clear opposition. It is important first to recall that there is one overriding goal for President Recep Tayyip Erdogan in launching the Jan. 19 invasion of the northwestern corner of Syria: to win the next Turkish presidential election. Disappointed by his poor showing in a national referendum in April 2017, he is determined to leave no doubt about his next trip to the polls. He can call those presidential elections at any time, and if his move into Syria is successful, he may well call elections this spring or summer. Heightened nationalism is key to his success. Moreover, Turkey is not just a NATO ally going through a tough period. Erdogan has ambitions for his neighbors and for the Middle East as a whole. He aims to militarily dominate the immediate geography south of Turkey’s borders. On Feb. 6, he told his ruling Justice and Development Party (AKP) parliamentary group that Turkey has “wasted the last two centuries with sacrifices” and has “lost around 5 million square kilometers” of land belonging to the Ottoman Empire—an area about half the size of the United States. He may care less about addressing Syria’s chaos than he does about using it to control who rules south of Turkey’s border—with or without a future peace treaty. To do so, he must eliminate any Kurdish influence in regions south of Turkey and any Kurdish role in negotiations for the future of Syria. In addition to Turkish bases and installations now in Syria and Iraq, Erdogan now has Turkish bases in Qatar, Somalia and a site for a possible naval base in Sudan on the Red Sea. Turkey is investing heavily in the development of its own national weapons, is on the list to acquire 100 F-35 joint strike fighters and is acquiring technology for next-generation armaments. Turkey’s Foreign Minister Mevlut Cavusoglu warned in 2016 that Turkey might look outside NATO for defense cooperation. Turkey now has purchased Russia’s advanced missile defense system, the S400, the same system now in Kaliningrad arrayed against the Baltic states. These actions indicate a clear path for Turkey to become a major independent military power in the Middle East. Erdogan’s ambitions may also be territorial. He stated in November 2016 that the 1923 Treaty of Lausanne, the founding pillar of the Republic of Turkey, was not a “sacred text” and is open for “discussion.” In September 2016, he had publicly questioned the Treaty by saying that it had been presented “as a victory” but was the result of blackmail by foreign powers to force the surrender of much of the Ottoman Empire. In October 2016, Erdogan rejected an Iraqi demand for Turkish troops to leave Iraq by telling Iraqi Prime Minister Haider al-Abadi that “he should know his place.” Visiting Greece in December 2017, he told the Greeks that “some details” of the Treaty were “unclear.” Many Turks feel that Mosul and Kirkuk, in Iraq, should have been kept by Turkey in 1923. Erdogan plays on these emotions in the current campaign in Syria. Long-term occupation of portions of northern Syria may be part of his proclaimed strategy to build a “New Turkey.” These repetitions of aims on volatile territorial issues affecting Turkey’s neighbors are difficult to ignore. State that the security of Turkey is as important to us as the security of every other NATO ally, but underline that our NATO commitment requires Ankara’s partnership. In that respect, the U.S. offers to assist Turkey in preventing all cross-border transfers of personnel, arms and materiel to aid the insurgency in southeast Turkey. Further Turkish armed incursions against Kurds in Syria will render these offers null and void. Restate the clear U.S. priority, based on our experience in Afghanistan in the 1980s and Iraq in the 2000s, to prevent ISIS and al-Qaeda resurgence in Syria and the region. Tell Ankara that any U.S. movement on the Kurdish issue requires Turkish movement on the ISIS issue. Restate that an acceptable settlement for Syria within the U.N. process is our priority—the United States rejects the failing Sochi process engineered by Russia and Iran. Remind the Turks that the Sochi process puts no pressure whatsoever on Bashar Assad and thus far has legitimized his continued despotic rule. State that the Kurds have a right of self-defense and a role in the determination of Syria’s postwar future. Repeat that the Jan. 14 characterization of a “border defense force” comprised of SDF fighters was inaccurate, but make clear that the Kurds cannot be left helpless before Assad, ISIS and Al Qaeda (or Turkey). Offer centers of joint cooperation (observation posts, intelligence centers, and joint patrols) along the Turkish-Syrian border to help seal the border. In exchange, the Turks will not invade Kurdish-controlled territory east of the Euphrates. If Turkey agrees to cooperate on the points above, the United States will withdraw American forces to east of the Euphrates. 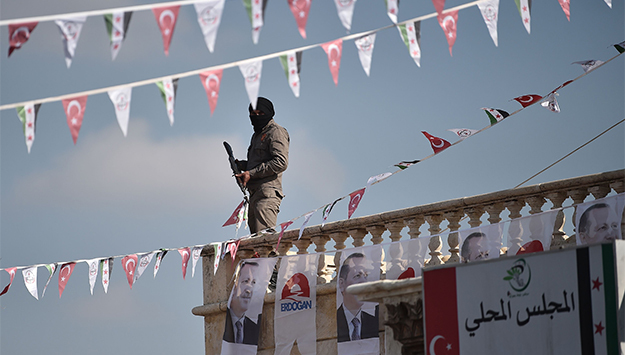 Turkey’s incursion on Jan. 19 is creating conditions that benefit ISIS. The current campaign is helping Russia and Syria regain territory controlled by regime opponents. There is a genuine risk to Turkey and the region from the Iranian missile program and Iran’s plans for a land route across Syria to Lebanon. That effort also will directly threaten Israel, which will respond. America will oppose any and all Kurdish-Iranian oil contracts. Highlight that Iran’s proxy wars in Lebanon and in Yemen further destabilize the region and threaten Turkish interests. A weaker Saudi Arabia and Egypt will only help Tehran and will result in no gain for Turkey. Remind that, while Turkey has been working with Russia since 2015, the Damascus regime has only gotten stronger. Russia approved Turkey’s current campaign partially to weaken U.S. links to Ankara, but in major part to aid the current Russian and Syrian campaign from the south. Russia has given Turkey just enough to keep them in the Sochi process but also supports a Kurdish role in the peace process. Turkey needs better friends than the ones it has chosen thus far. Russia does not trust Turkey and only seeks to exploit its anger against Washington for its benefit. It might be useful to remind ourselves of what has become a well-known methodology for Turkey’s political diplomacy. First, Ankara blames the opposite party—the United States, the European Union or whomever is the object of their effort—for the problem. Ankara never accepts any responsibility for contributing to tensions and always characterizes Turkey as the victim of malevolent forces. Second, Turkey engages in an active public effort to shame the opposite party—for example, calling Europeans “Nazis” and claiming American complicity in the July 2016 coup attempt—with extremist rhetoric to build domestic support. Third, when steps one and two bring unsatisfactory results, Turkey’s leaders often present a peace offering, claiming that Turkey is willing to discuss difficult issues, but cannot find a willing partner. Often Turkey repeats this cycle of “blame, shame, and claim” to ensure that Turkey’s position is constantly repeated to its public. Keeping the issue alive can be more important to Ankara than solving it. The correct antidote for these attacks is to insist that Turkey state what it will contribute to an equitable solution. Tillerson’s Stanford speech outlining American plans for Syria on Jan. 17 has commendable principles. However, we know that the United States currently has the diplomatic, economic and military resources only to fulfill a small portion of those requirements. If we are now to say what we mean and mean what we say, we must be clear and committed in our conversations with Turkey in the coming days. When the two of you report on the results, the American people will want to see clearly that we have protected our country’s interests and security.